This is a great question we received on Saturday......does eating little and often encourage fat loss or benefit your health? Let’s cut to the chase: No! This dietary “gem” relates to conventional dietary wisdom favoured by health and fitness establishments who suggest this eating little and often will help you keep your metabolism up and stoked and thus increase your fat burning possibilities. Running alongside this dietary myth is the idea that if you eat less than once every three hours, your body goes into starvation mode and your metabolic rate slows down causing you to store more fat. Kind of like a hibernating bear…..
Let’s review the science: our metabolic rate is determined by the energy required to keep our cells alive and functioning in good order. This is our basal metabolic rate and remains at a constant level. It will increase if we gain weight as we have more cells requiring energy but if our weight is constant then we will still burn this amount of calories throughout the day through existence and routine alone: not eating or eating does not affect that; it is simply the amount of calories that we require in homeostasis. And not eating: does it slow down out metabolic rate? The science says a definite “no” – for example, in a study putting people under starvation conditions for three days they saw no drop in metabolism and in fact saw a slight increase in metabolic rate after 36 hours of fasting (starvation) and slightly higher again after 72 hours…. In another study at the Pennington Biomedical Research Centre, men and women who fasted every other day for a period of 22 days, experienced no decrease in their metabolic rate. This confirms that our metabolic rate does not decrease at all when we don’t eat for three days and confirms that eating little and often to keep your metabolism up is not necessary as it doesn’t drop in the first place! But you are right: so far we have only demonstrated that not eating does not slow our metabolism…what is the affect increased eating has on weight-loss: does it increase our metabolic rate and does it reduce muscle loss? In a study using participants at a healthy body weight (BMI between 18 and 25), individuals were compared eating three meals a day with those eating one meal a day at the same calorie levels (although not focusing on calorie restriction) but instead at maintenance levels not intended to cause weight-loss (but to study the effects of decreased meal frequency) actually found that eating one meal a day decreased body fat levels by 1-2kg over the 8 week experimentation period. There was no change in body fat for the three meal a day group. The fact people lost body-fat from eating the same number of calories in a single sitting rather than across three meals shows that eating more frequently has no advantage. In anther study using 16 obese individuals divided into two groups and comparing 6 meals a day against three meals a day with the same calorie consumption for 8 weeks found there was no difference in weight loss between the two groups and no signs of increased metabolism from the higher frequency meal group. There was no difference in lean muscle preservation either, the muscle loss was exactly the same too: the hunger levels; and satiaty were similar showing that eating more often does nothing to improve the sensation of fullness. Comments we have received on this subject illustrate the pitfalls of eating in this way: one client in particular confirmed what common sense would dictate: small meals are never enough and the opportunity to overeat is therefore ever present. Another client remarked that this advice came from body builders – now wait a moment, surely a body builder’s objective is to bulk up and what’s your objective with fat loss……counter intuitive when you start thinking about it? With no practical advantage to fat loss and a practice more akin to cattle, we urge you to quit grazing, go back to basics, heed the advice above (and Prince Charles) and eat when hungry and stop when you are full. Once again: The little and often myth is busted! Thanks for clearing that up. In the past I have been told little and often works but then food was a major focus all day. Too much planning. Since I've changed to the Paleo diet I have found I am not as hungry (I think the grains produced a hunger in me) so I am not so focused on what I am going to eat throughout the day or when or how. So, it is really not an issue for me anymore. Thanks for a great post! I noticed myself that I feel a lot better if I eat 3 square meals rather than snack all day. My digestion is a lot better with less snacking, too. I think it is a big marketing campaign from the companies who sell snack foods and need to sell more of them to convince customers, us, that grazing is a healthy concept. Thanks for sharing this insightful research. I agree that "Clean Eating" which is one of the primary diets that promotes 6 meals a day was started by body builders. It is helpful to remember this when deciding what's right for you. If you are truly hungry and have an exercise level that requires 6 meals a day, then perhaps more than 3 meals a day is a good model. Otherwise, it is possible you could be consuming too many calories! That was great info! I've been wanting to hear something like that, because as hard as I try, I can't seem to eat that frequently during the day. Three meals works for me..and I'm glad my body is okay with it too!!! I find that if I just stick to three meals a day then I get hungry between meals. When I get hungry, at the next meal I usually eat more than I usually would and wont necessarily make healthy food choices. 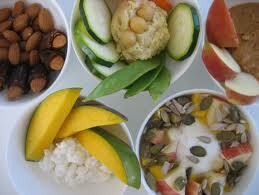 Snacking helps keep my hunger levels manageable so that I can eat just what I need at the next meal. I am careful with what I choose to snack on though, which might just be an apple, half a handful of nuts or a couple of spoons of natural yoghurt in a glass of milk.